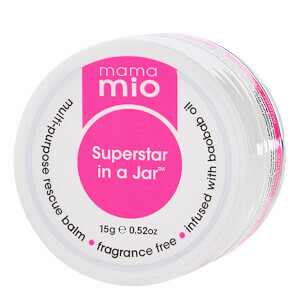 At Mama Mio we understand the need for safe and effective skin care which is why we have developed the Gorgeous Glow range. This range is perfect for pregnant faces which may be prone to unwanted breakouts. Our products may help to cleanse and balance skin and can reduce the appearance of tiredness during though restless nights throughout pregnancy! Our No Nasties multi-purpose day and night cream can help to restore your natural facial skin tone. The mega-moisturising serum can help reduce the appearance of fatigue, leaving you looking bright and feeling fab! We have added pregnancy-safe lactic acid to illuminate skin and help prevent hormonal breakouts. Lactic acid gently exfoliates to free skin of dead cell build up which is one of the main causes of acne. Top Tip – Apply an SPF to skin during this hormonal time to help reduce the damage caused by the sun! The cocktail of refreshing ingredients will deliver deep moisture to reduce the appearance of puffiness and improve the look of skin tone. Our extremely light-weight serum can help reduce the appearance of wrinkles. Our lightly cleansing formula is perfect for delicate skin. The naturally exfoliating ingredients help fight blemishes caused by hormonal skin, which is why we think it's the erfect product to prepare your skin for a long day. Our hydrating facial wash may leave you smelling incredible and vividly fresh.